Want to become the type of man women find irresistible? Want to be able to trigger instinctive attraction? Are you always the friend, and never the lover? Wonder why jerks always get the girls and nice guys are always in the friend zone? 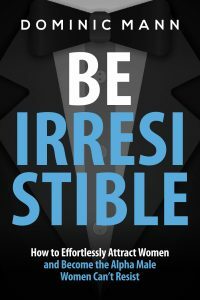 Be Irresistible teaches you how to become the man women lust for. Countless pickup artists have found odd tricks, gimmicks, and lines that work for a little while. Be Irresistible gets to the very core of female attraction—the masculine traits that women have evolved to be instinctively attracted to. Wake up each morning covered in women. How to become the man women lust for. How to have women feel a powerful respect for you that makes them weak at the knees. Discover irresistible masculine traits, and how women secretly test you for them. How to create intense sexual polarity that ignites magnetic attraction.